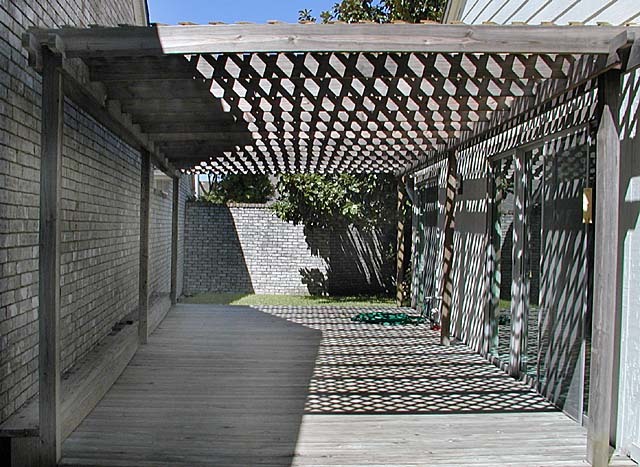 I put up this deck cover in October 2000 thru spring 2001. I was in my early 60s, I am now in my 80s and find replacing the members difficult. 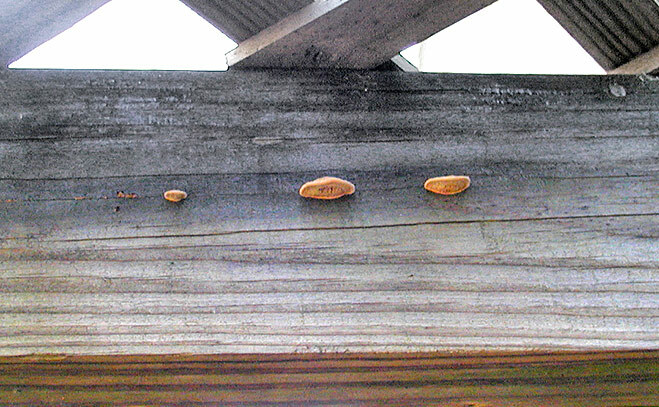 The structural members were untreated yellow pine from Home Depot. 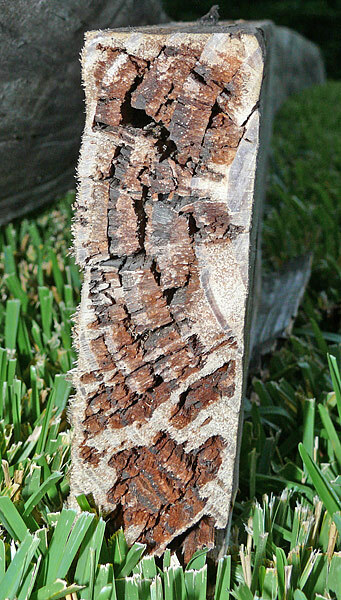 In less than four years it developed a severe case of rot from fungus or lichen or something. 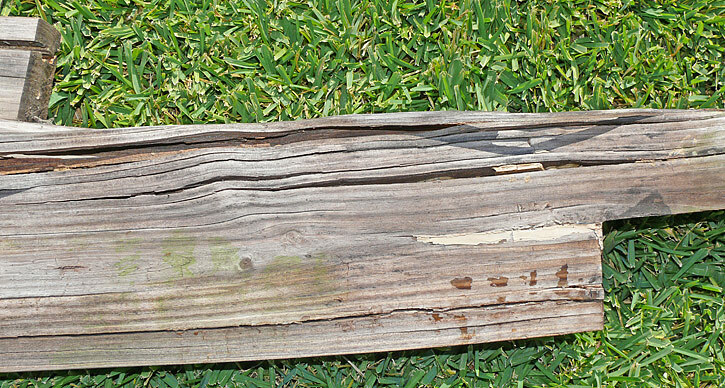 This wood does not remain wet. 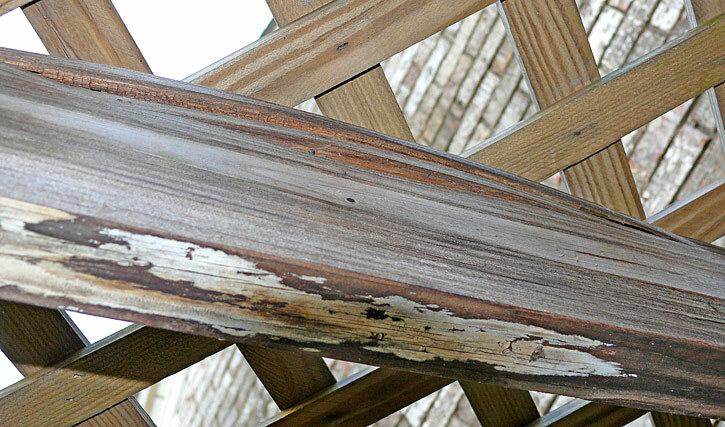 It dries quickly after a rain, so it shouldn't have rotted. 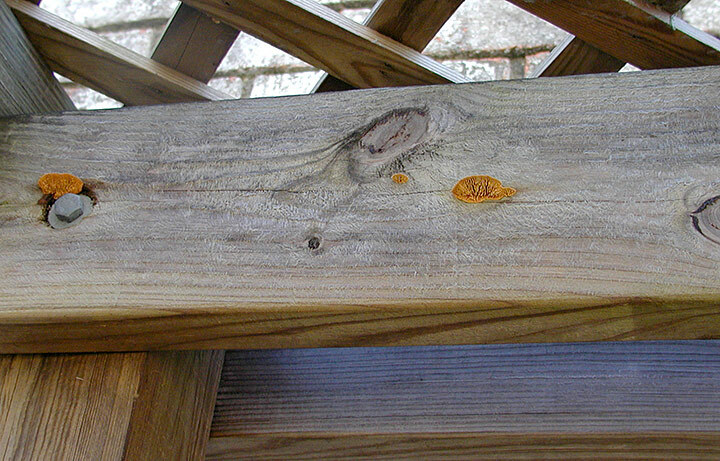 The untreated yellow pine members I replaced when I built this new structure were 20 years old and showed no signs of rot. 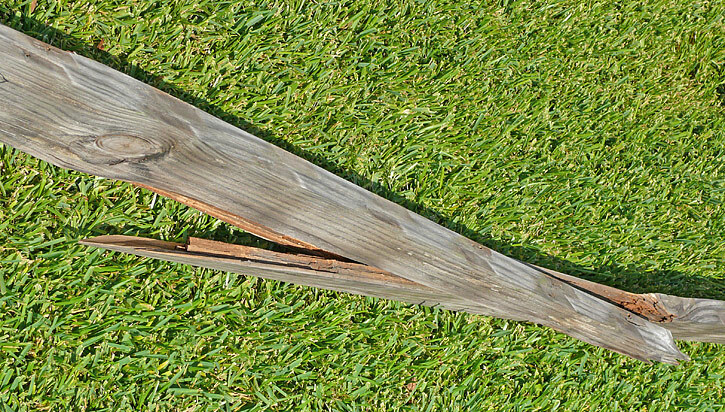 It's obvious the lumber from Home Depot had a disease inside it that has rotted the wood from the inside out causing me much grief. September 1018 -- Over the last 10 years I have replaced all but 5 of the 16 failing rafters & the 4 beam rails in the picture above one or two at a time. In 2008 I thought I had killed the rot but I had just stunned it. The cross member (rafter) in the pictures below is the worst right now but the remaining 4 members won't last a lot longer. 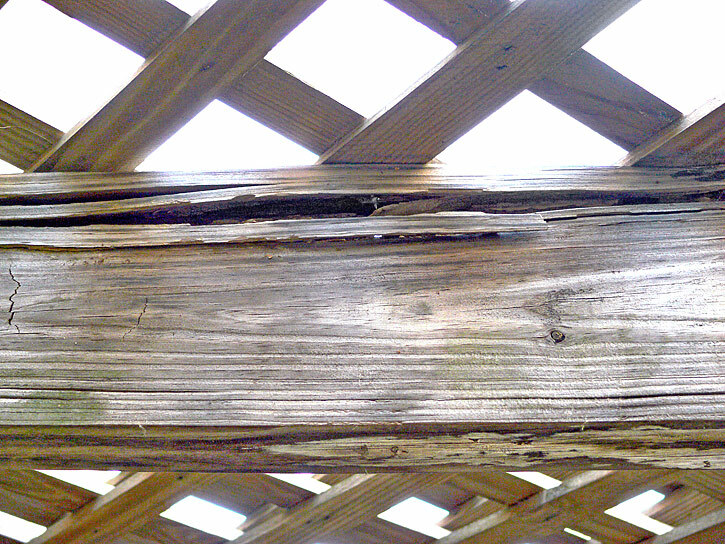 September 2008 -- At seven years the rot has reached failure in several areas and I replaced four cross members (rafters). 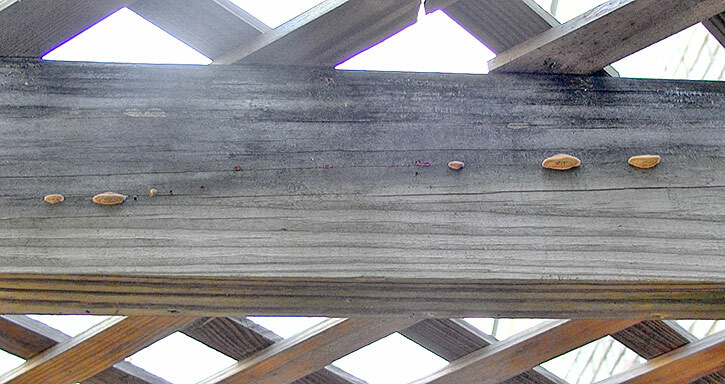 Four of the rafters had rotted to the point they were breaking of their own weight. 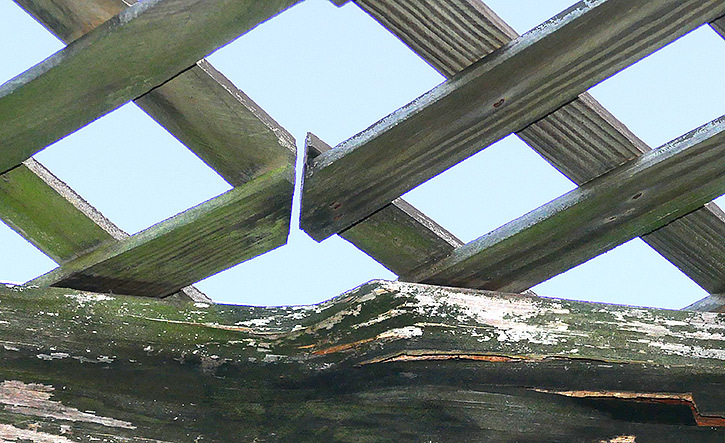 Two rafters were being held up by the lattice. Of course, they were very light now as the rot has consumed them. Two more were barely hanging together. I've had to spend the last two weeks replacing these four members. More need to be replaced but these were the worst and all I was up to. 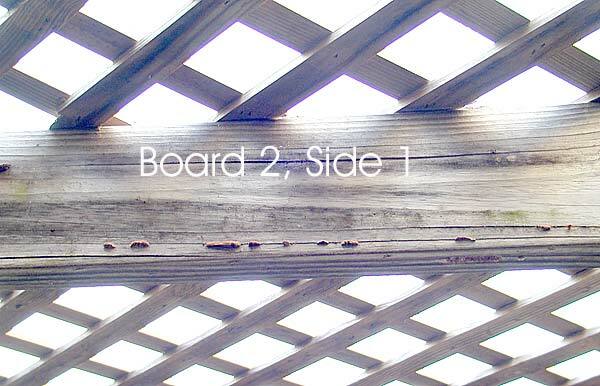 The pictures below show the extent of the rot. 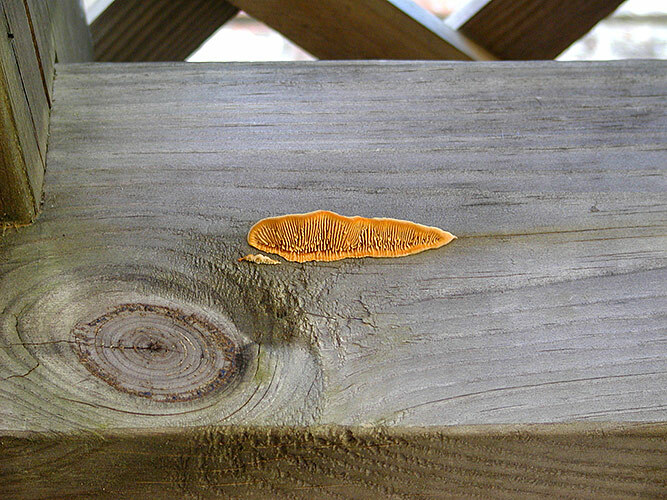 After learning antifreeze kills rot, I had soaked the outside of the wood with it every year since I first discovered the problem. It never seemed to affect the progress of the disease. After replacing the four cross members described above I decided to try to get antifreeze inside the remaining wood. I got an IV bag and tubing. 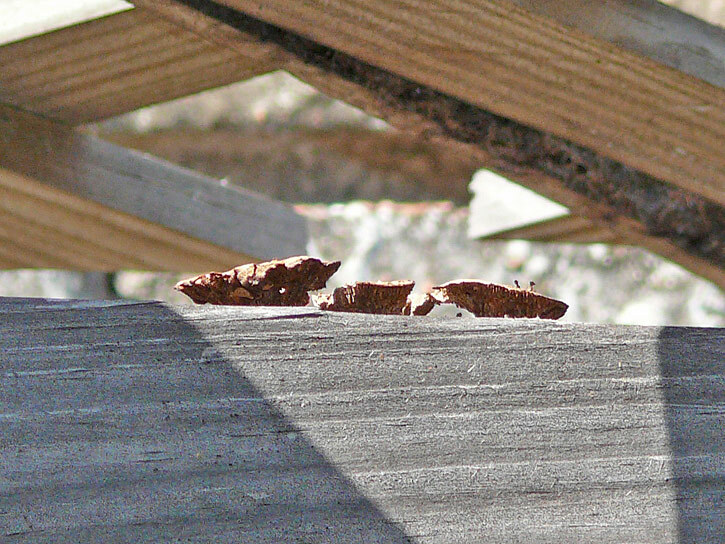 The wood had decayed to the point I could easily push a awl into the top of the beam and then insert the needle. I would make a hole and treat about every 2-3 feet. 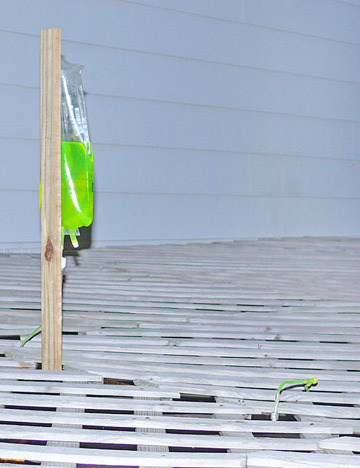 The wood (actually the rot) absorbed 5 gallons of antifreeze. 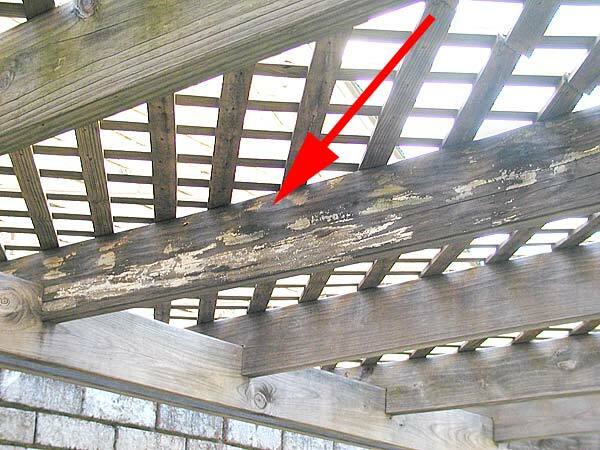 This appears to have killed the rot -- at least I've seen no more growths on the cross members or beams. 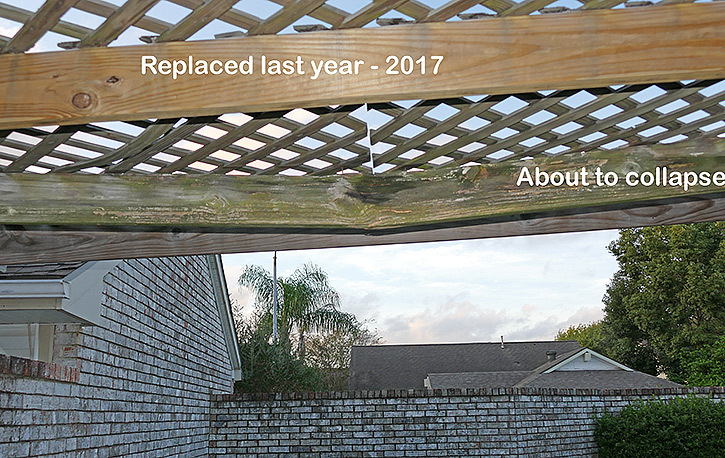 In the fall of 2011 I replaced the worst of the main beams, and things seem stable at this time. 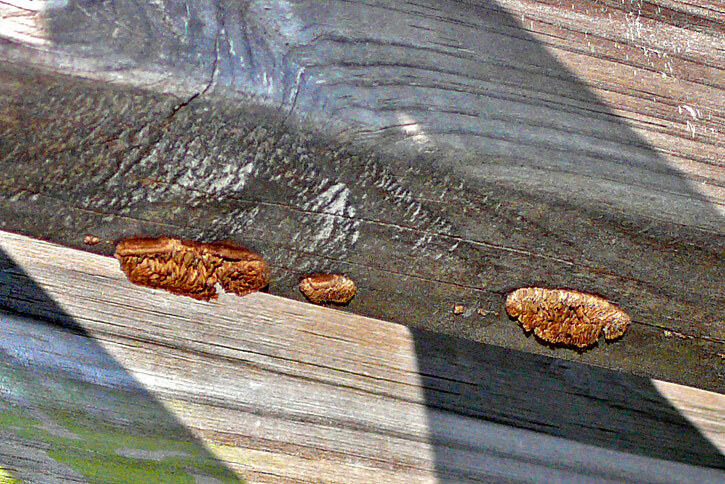 I thoroughly resoaked the members with antifreeze and waited until February 2008 to scrape protruding fungus off hoping the antifreeze would work it's way back through the fungus to the disease inside the wood. 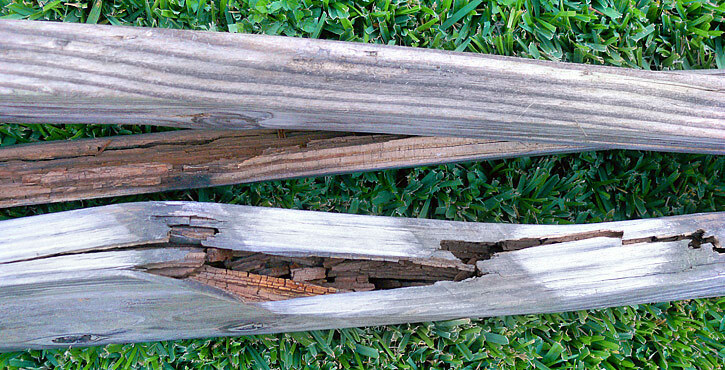 Serious rot has compromised the structural integrity of several cross members. 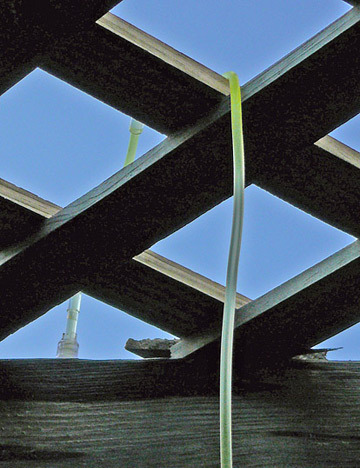 I examined the structure again today and the fungus is progressing in many areas. Below are but a few samples. I retreated with antifreeze, and scraped off the the protruding fungus. The two cross members in the following illustrations have been affected by fungus. 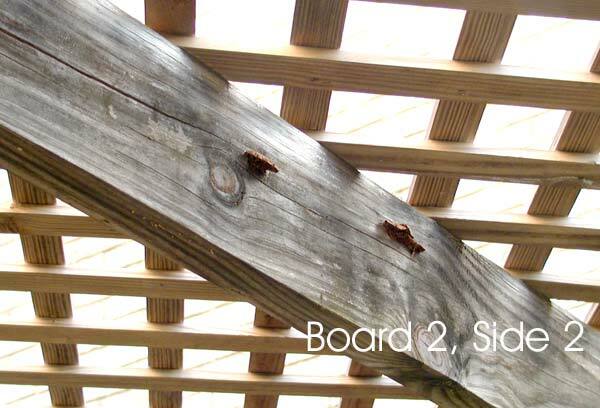 You can see from the ones in the background of the first picture what the rest of the boards look like. 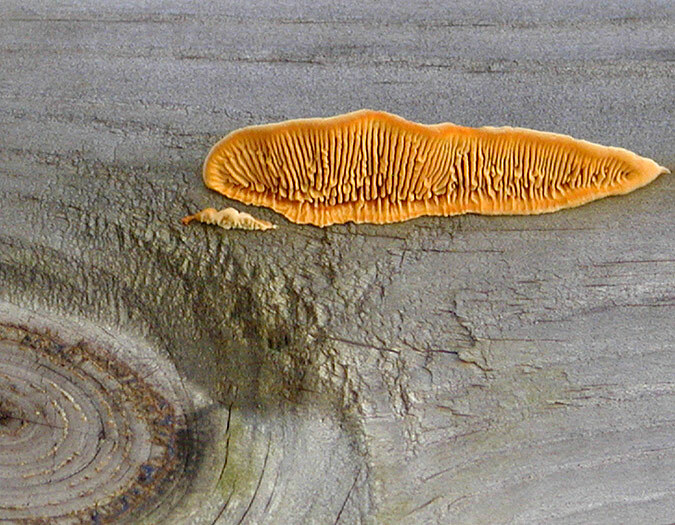 The board in this first picture has grown some kind of fungus or lichen. 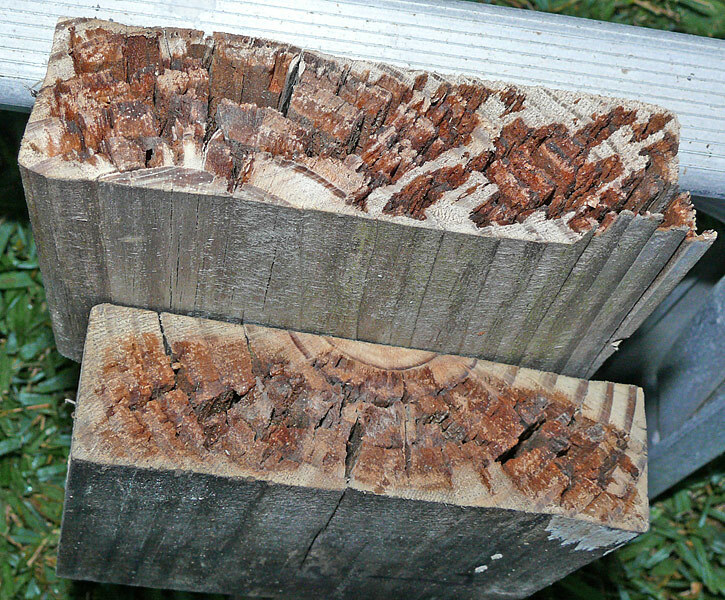 The board also seems to be splitting much worse than the unaffected boards. I cleaned it off once and treated it with a fungicide. Does anybody know what's causing this, and how I can stop it? 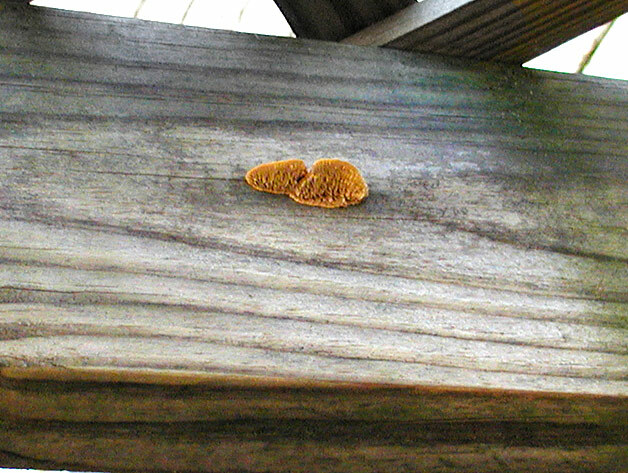 There is another kind of fungus/lichen growing on a second board. Below are pictures of the two sides of the same board. 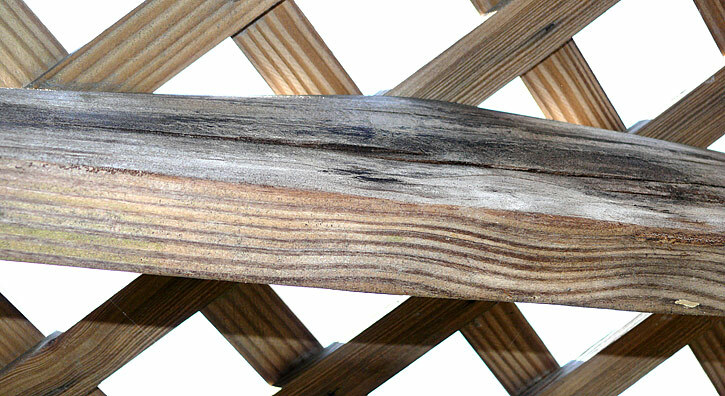 In September of 2001 I bought some yellow pine lumber from your store at 20251 Gulf Freeway, Webster, Texas. 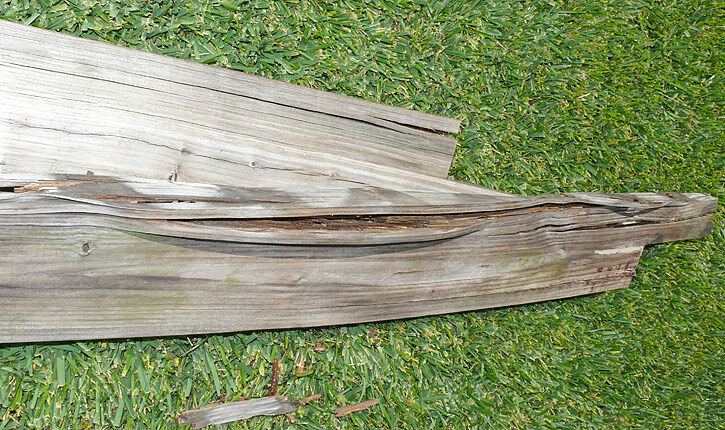 As time passed it became clear this lumber was diseased and has ruined my deck cover project. For several years I have been keeping a photo journal of the progress of the disintegration of my project. You can find the full saga here -- http://www.factsfacts.com/deck_fungus. 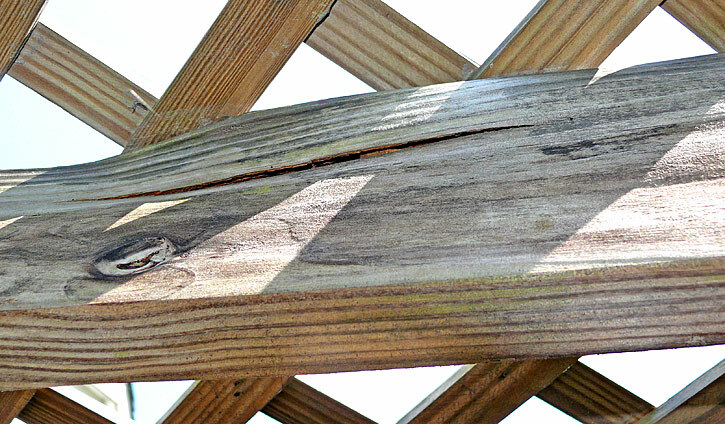 I am now 72 years and find it difficult to climb onto and around on this structure to do repairs. 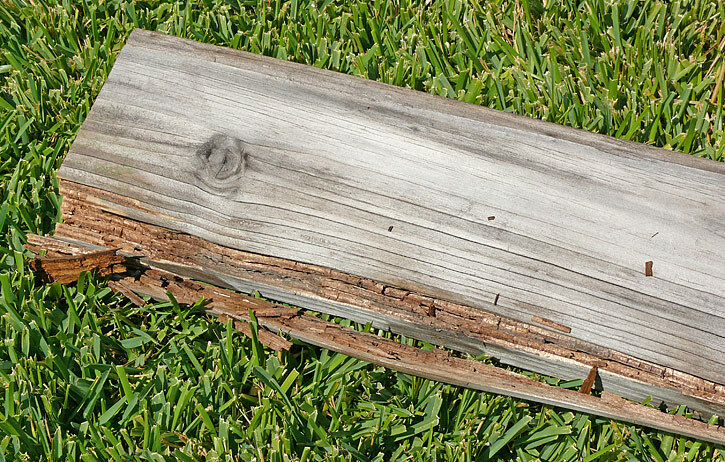 I am writing to learn if you or your company is interested in doing something to make good on this defective wood and the trouble it has caused.